- the image appears desaturated in the Color Efex window without filter actived. This is a known issue as you noted. Unfortunately there wasn't progress here, sorry. I will bump our report/link to this thread to bring this to developers attention. This is a known issue as you noted. Unfortunately there wasn't progress here, sorry. I will bump our report/link to this thread to bring this to devise attention. yes, I reported it in november 2017 ... Thanks for bumping this ! Yes, I also reported the plug-in colour management issue when I bought the first version of AP for Windows in Dec. 2016. It's not just the Nik Collection but all the plug-ins that I have (Nik, Topaz, Noiseware, PortraitPro) lose the embedded colour profile when started from Affinity Photo. Those same plug-ins work fine when started from other applications or when using them in the standalone mode. Scroll down to Test No. 1 and right-click and save the first jpeg photo (the grey square). Open the jpeg in AP -- it should display a grey square. Non-colour managed programs which disregard the embedded profile show a red square, not grey. Invoke any plug-in that you have and you'll see that the grey square is now red (colour-management test failed). glad to meet you here. Yes, you have been faster than me and unfortunately without more success ... I have to insist that I know some users who have given up Affinity Photo because of that! There is not a plethora of reasons for this problem : it is enough to display a picture defined in a very large and unspecified space in a smaller space: the desaturation is purely mechanical. This is typically a color management problem. Yes I can confirm that. Nik Plugins are very important for me too! I am currently evaluating AP - deciding whether I can end my CC subscription and bind myself with Serif. This bug is going to make me stay with Adobe, since I planned to complement AP with plugins in case if I run into any missing / lesser implemented functionality for the time being, until AP matures. Some plugins don't have a standalone version (most Topaz plugins do not). It's a dirty solution for this problem. They used to have independent plugins before Topaz Studio's introduction and a few are still available from their site. The others were already integrated in Topaz Studio itself but you can still access them running Topaz Studio as a standalone program. I've seen that all plugins work are working in Affinity Windows except Vivenza2. Vivenza 2 also works, but in Vivenza you get wrong colors. Once back to affinity, the colors are correct, but in practice it is a nightmare to correct here. So I tested some more, and found that Vinvenza is working correct with my 6MPix images (D70s). I also changed color depths, because the D70s is using 12 bit color depth, and the D750 14bit, but this made no sense. I only found a dependency w.r.t. resolution. The D700 (12mPix) and D750 (24MPix) images did not work correct. This is reproducible.! I hope that Serif will fix integration with plugins and I hope that they will implement Live plugin filters. I can't see myself having to restart adjustments in a plugin every time from scratch. Photoshop does it really well with smart objects. On a aside note I want to say that I am very impressed with Affinity Photo and I completely get how much work it takes. I believe in AP and I want someone to bring healthy competition to the imaging, therefore I canceled my Adobe CC subscription and went with AP license. In fact, I tested an image of D800 in sRGB jpeg and I have the same desaturation in Viveza 2 ... but I saw on the contrary a super saturation of the same image in DFine 2 ... It's correct in Color Efex 4. Despite this, there is no question of converting to sRGB in the processing flow. sRGB conversion is done at the end of the processing for the web outputs. I hope so ! I canceled my CC subscription in november 2015 ! And I still use old licenses ... but I wish to definitely switch to AP. I re checked my statment and tested it again, and I found that I do not have that problem you discribe, maybe because I take an other route to go in affinity. Or again a resolution difference you and I have (I'm using the D750). As told before, my old D70s shots work well with Vivenza2 and affinity. I start in Nikon NX-D, there I set / change all my camera setting (I use raw) and I can use the built in U-point in NX-D for local adjustments. From here I port the file (as tiff) to Affinity. I stopped importing RAW in affinity, because it was often way off from what I get when starting at Nikons NX-D.
Additionally I can use the Nikon built in Vivenza2 kind of, and if I really need Vivenza, I also can start Vivenza2 from NX-D before I move to Affinity. 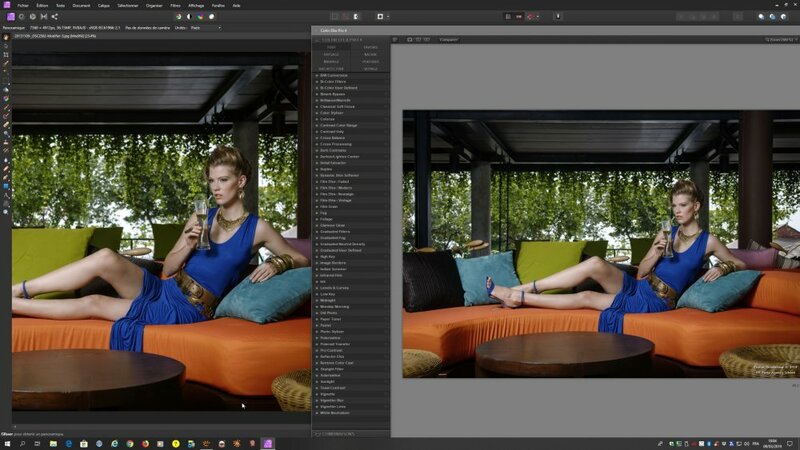 Using this flow, you'll see that it makes a different using AdobeRGB of sRGB within Affinity icmw the DXO plug-ins. It has nothing to do with DXO, because using the plugins started from NX-D, the DXO plug ins work fine, as well with sRGB and AdobeRGB. 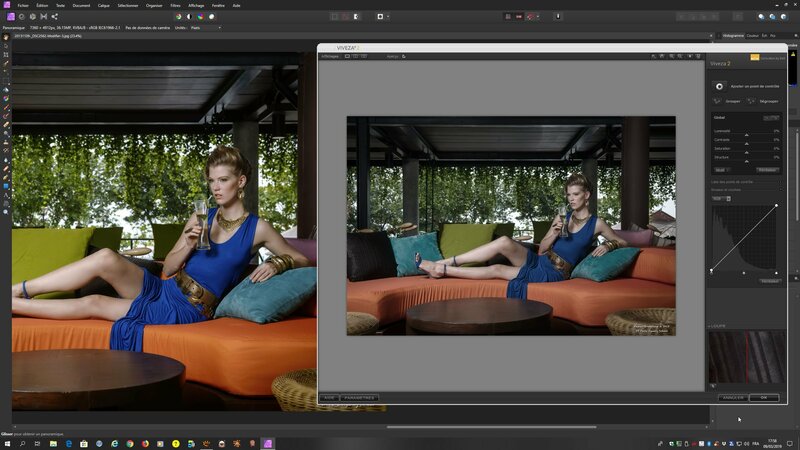 1ste picture: sRGB, started at NX-D, then from NX-D ported to Affinity. Here I started Color effects and as you can see, it matches pretty well. Colors are at least close. I repeated this for all (color)plug-ins to show you the behavior. and now a bigger color mismatch could be seen...! Having the screen-capture is it less good to see but look at eg the door and the yellows. All pictures are from source. Nothing was corrected upfront. That's why you see also differences between the NEF. The first are comming from NX-D, the second from Affinty. 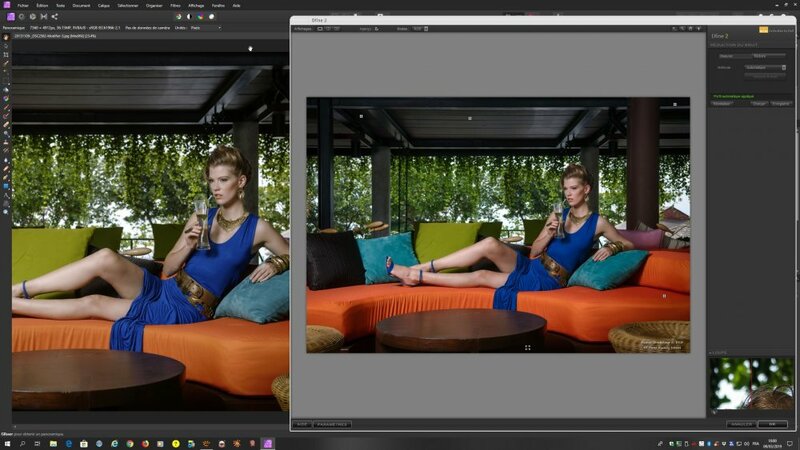 I learned, Affinity cannot handle Blue / purple correct using RAW import. That is really awe-full in affinity. I'll show you later some differences on a night shot with blue-purple lights. @Affinity, I'll upload the original NEF file. You can test it yourself. I also precise that with the same image in my old CS6 and the same plugins, I always have the same good colors as the original. It's unfortunately unusable because the corrections are done on the image displayed by the plugin. 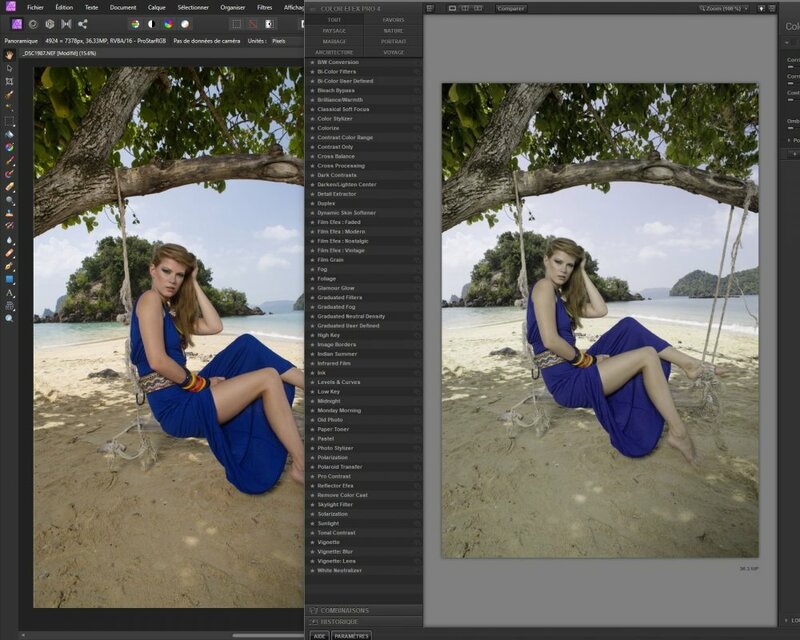 Can you try to develop this image with CNX-D in ProPhotoRGB instead of sRGB, for example ? I'm a bit over asked here. Not sure what you mean with the question if I can develop this image with cnx-d in ProphotoRGB? Is that a program or a camera setting or? Would like to help, but I need to understand is. I've sent the raw file already to the Dropbox of Affinity. With which software did you import into AF on the second screenshot? Do you own CNX-D from Nikon? The second picture was opened as nef in cnx-d and transported is as tiff to Affinity. I also will add the screenshot from CNX-D when I'm at my office again.